Competing with the Jeep CJ-5 and International Harvester Scout SUVs, the first Bronco debuted in 1966. 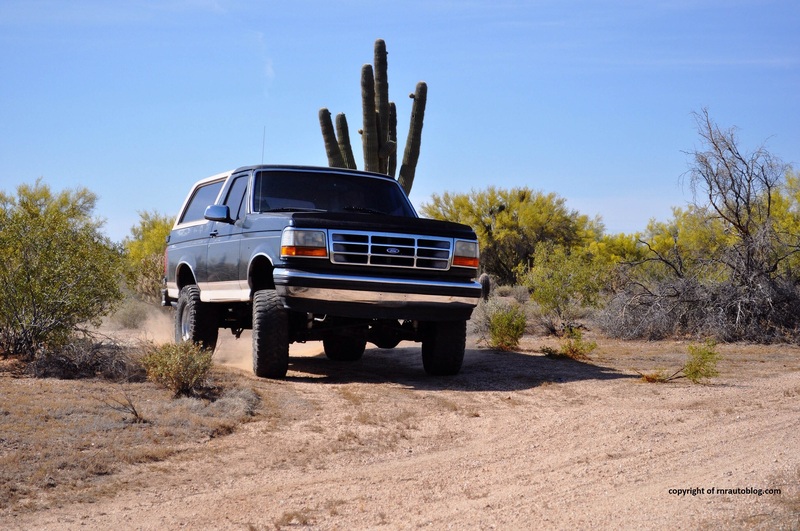 With no automatic transmission or power steering option, the Bronco was considered very spartan for its time, but proved durable and capable off road. 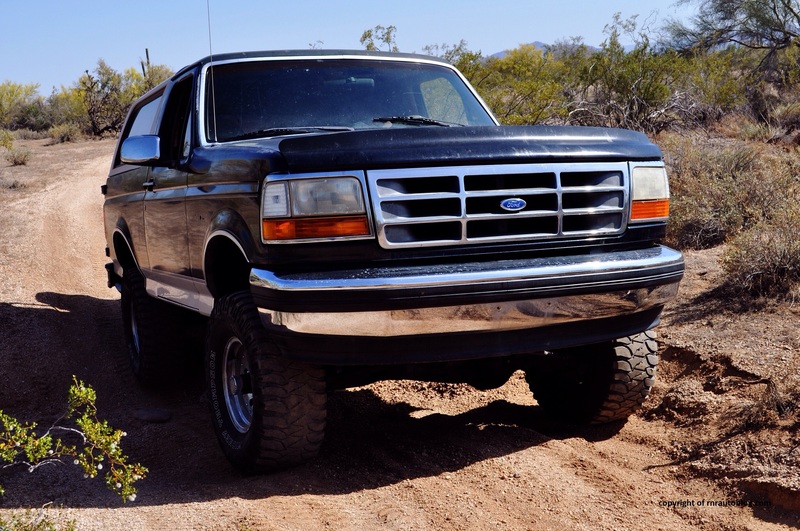 It become a favorite for off roading enthusiasts, and it was used widely for off roading competitions. This generation lasted 11 years, before a new generation of Broncos debuted in 1978. Starting from 1978, the Broncos were divided in two categories: the Early Broncos and the Full-Size Broncos. 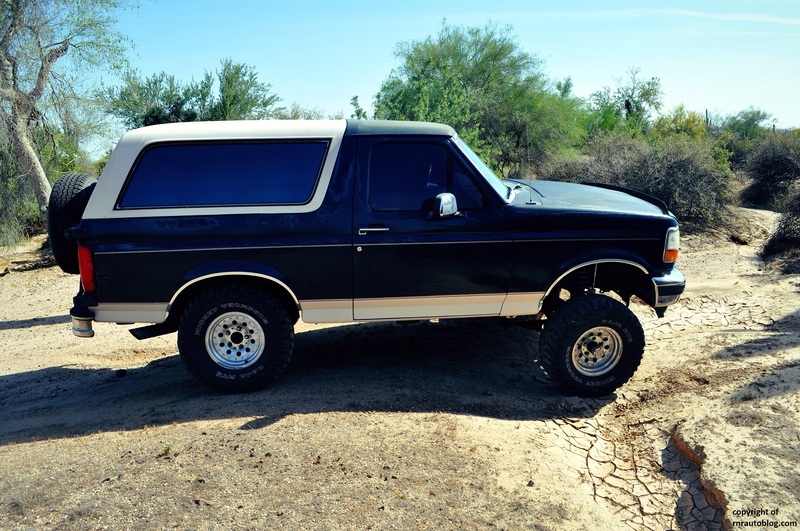 The 1978 Bronco was based off the F100’s platform, and used the truck’s powertrain and other components. Three more generations followed, and they were all a derivative of the F-Series truck. The last generation (1992-1996) was the most well-known, mostly because it was OJ Simpson’s vehicle in a highly publicized car chase. 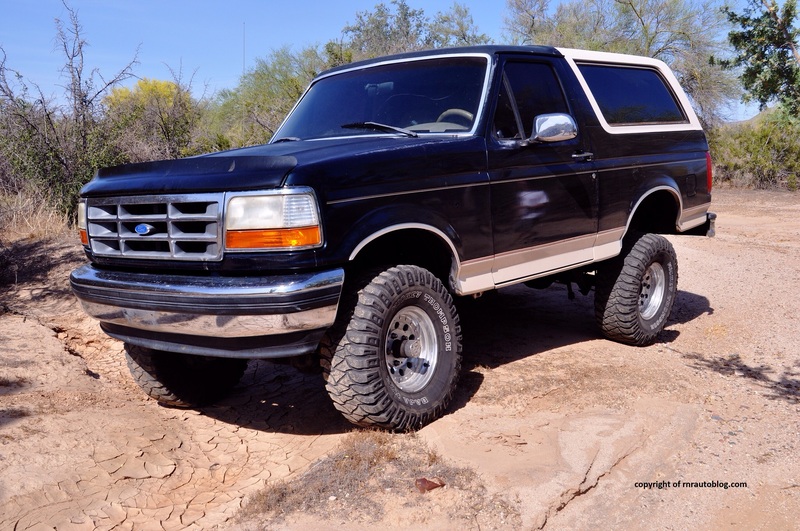 When I asked my mother if she knew what a Ford Bronco was, she said yes. I was shocked, and I asked her if it was because of the Bronco’s heritage or its coolness factor. She asked me, “Wasn’t that the car OJ Simpson was driving in that car chase?”. Go figure. 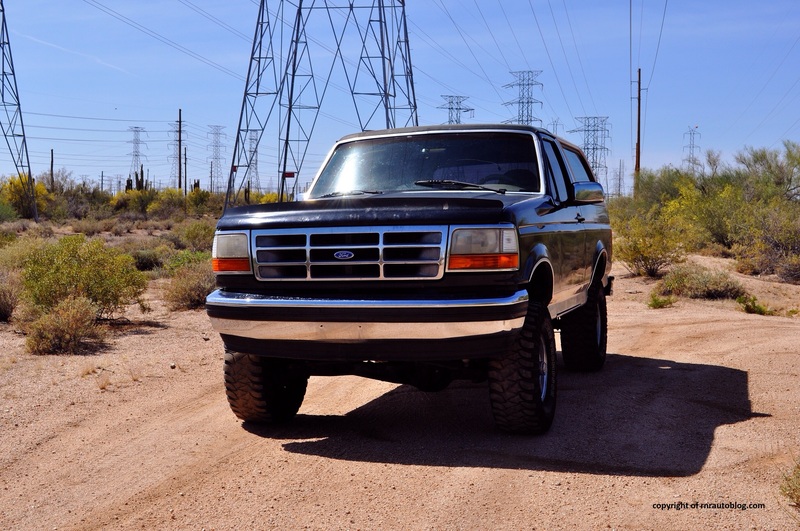 Ford discontinued production of the Bronco in 1996. 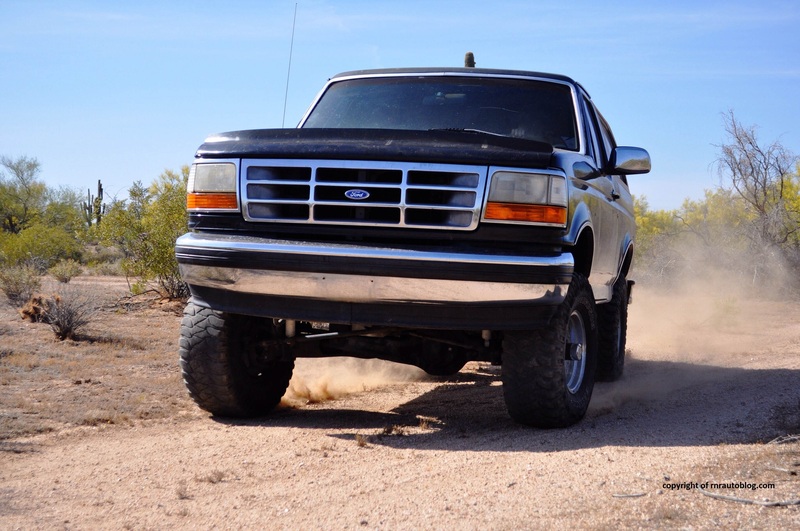 If you think that the Bronco looks like a truck, then you are right. 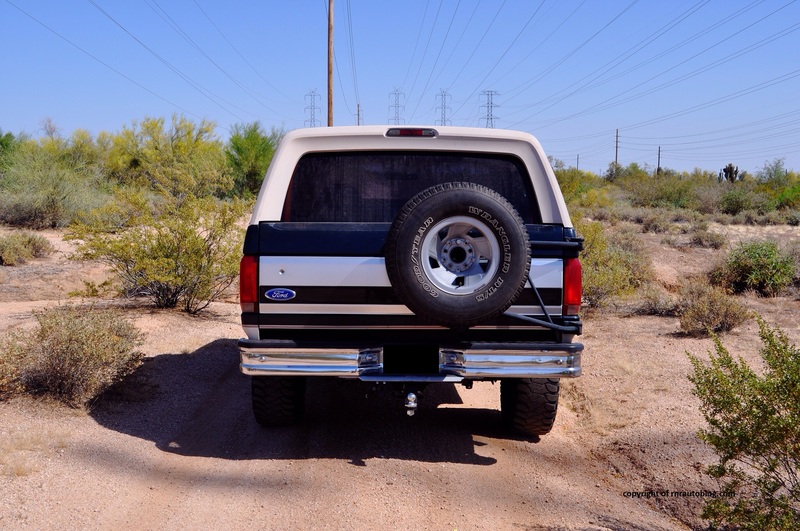 The entire front and rear ends are carried over from the Ford F-Series truck. Looking at it head on, it looks aggressive and tough without being over the top. The side profile is conventional for the most part, although I feel like Ford could have come up with a better color combination. The tan top does not mesh well with the green exterior in my opinion. As for the rear, the mounted spare tire is debatable. I can’t tell whether it would look better with the wheel off or on. Aside from the sun fade and the scratches, there is nothing fundamentally wrong with the design as it is still handsome and simple. The interior definitely feels like it is from the 1990s as it is dated. 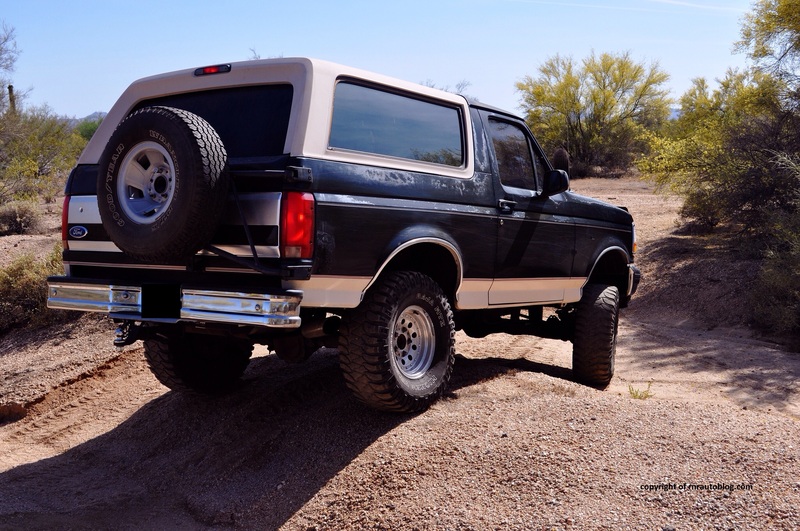 The Bronco’s truck based underpinnings become apparent as soon as you turn the wheel. 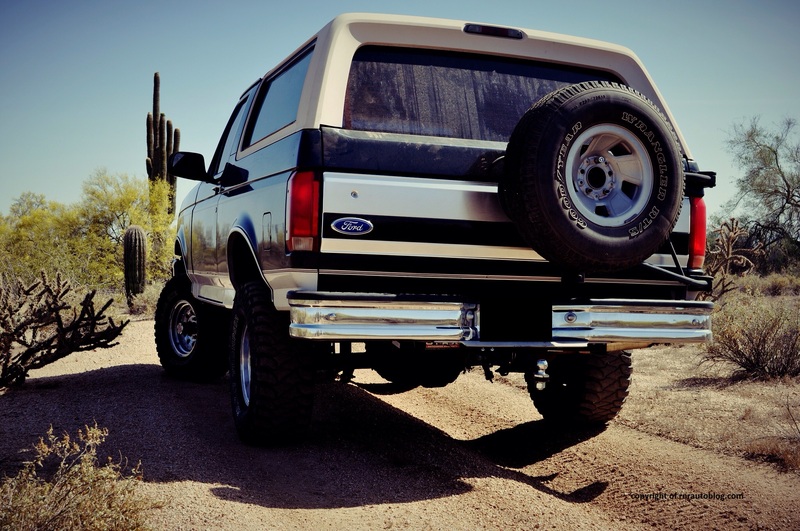 The Bronco employs a recirculating ball system which kept manufacturing costs down, but it is painfully slow. There is no feedback in the wheel whatsoever which makes piloting this barge even more difficult. 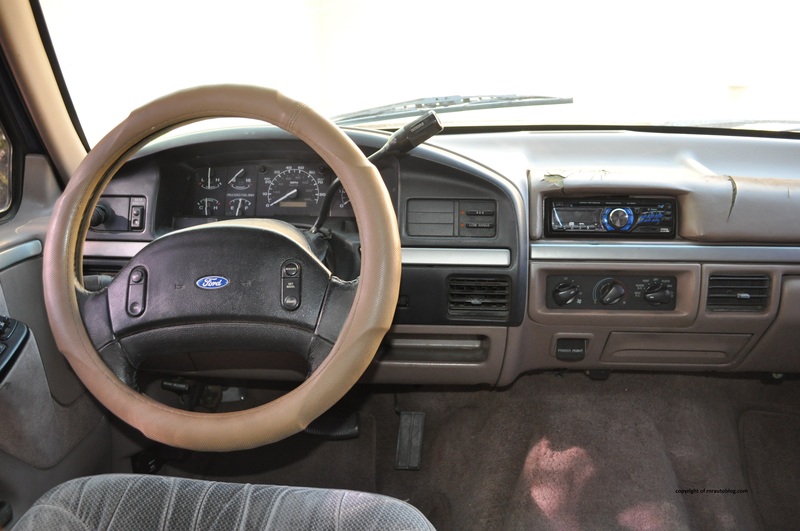 The steering has a lot of slop in it, as you have to turn the wheel a lot more before it actually turns. It lumbers dramatically in corners, but braking performance is surprisingly decent. 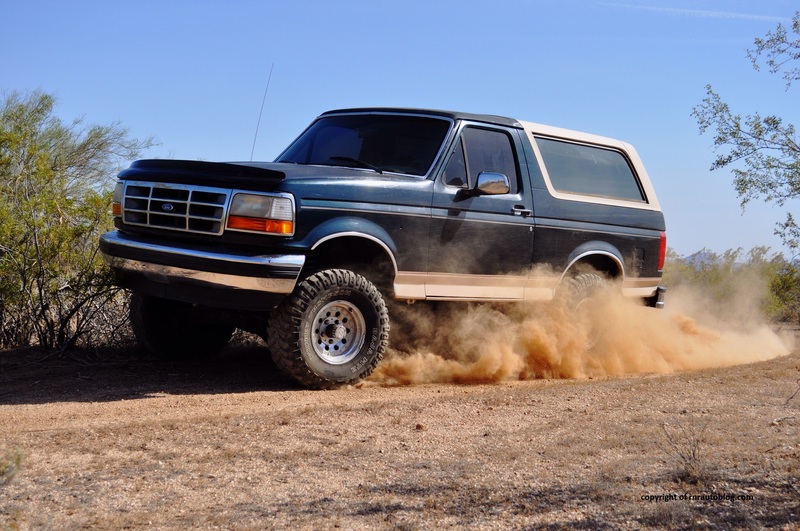 As for its offroad performance, the Bronco is a different animal. I am not exaggerating, but the Bronco is a beast. 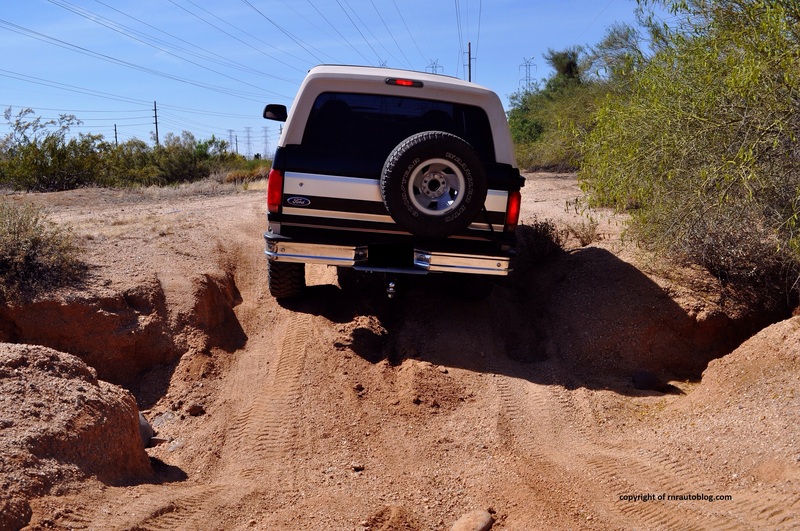 There were many huge dips and crevices that I actually thought we were going to get stuck, but as usual, my friend (the owner) does not listen to back seat drivers, and proceeded. Select 4WD mode and Low Range, and the Bronco just takes everything in its stride. It rattles noticeably, but it is not unusual for a SUV of this age. 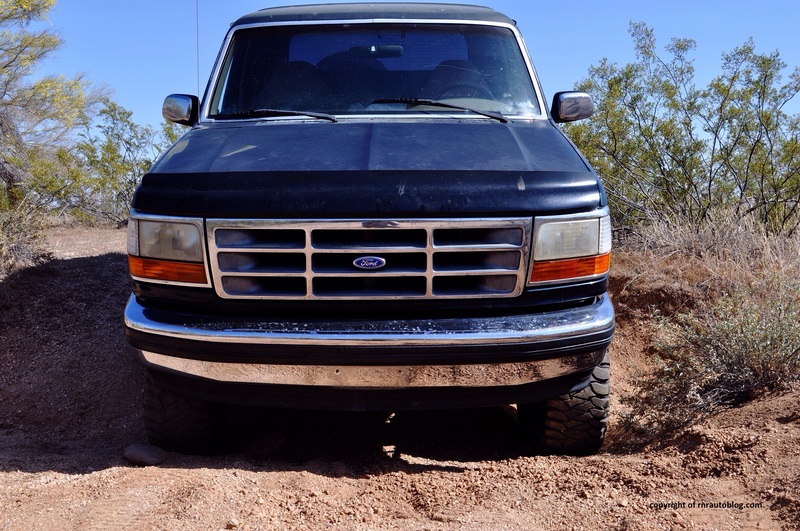 Even driving at high speeds in dirt, the Bronco displays decent traction, and I was amazed at its capability. On smooth roads, it glides, but its stiff suspension yields a jarring ride on poor roads. 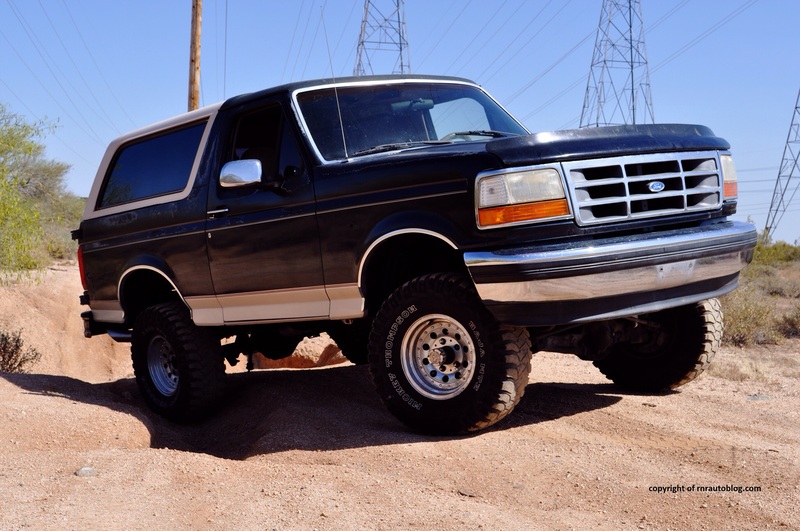 In 1993, two engines were available for the Bronco: a 185 horsepower 5.0 liter V8 or a 200 horsepower 5.8 liter V8 which this Bronco is equipped with. A 200 horsepower rating may not seem much, especially considering that Ford’s smallest SUV, the Escape, has 231 horsepower. But the engine provides average performance. What it does prevail in though, is its abundant torque. It is not super powerful, but it is strong and willing, which makes it the ideal engine for towing. The four speed automatic transmission shifts smoothly albeit in a leisure manner. What impresses me is its gearing. At 60 mph, the tachometer reads less than 2,000 rpm. With the 5.8L, fuel economy is a joke at 12 city/16 highway mpg. For an old SUV, it is surprisingly quiet. On the highway, wind and road noise levels are suppressed, and the engine quiets down to a subtle hum. When it comes to fit and finish, there is no denying that the interior feels low rent. The dash is hard to the touch, and the controls feel brittle. Some panels do not align well. Sit in the driver’s seat, and you are treated to an all around view of the road. Some of the seat adjustments do not work, so it is hard to find a comfortable driving position. The high roofline means the cabin provides generous headroom. The seats offer soft cushioning, but I suspect that it will give way over time like on a long trip, and become uncomfortable. The rear seat is roomy, and there is enough room for three passengers to sit comfortably. Access is problematic, especially without running boards. The high step in means that short people will struggle getting inside. The gauges and controls are logically laid out, and the trunk is huge. There is virtually no cabin storage. As an SUV in today’s society, the Bronco feels old. 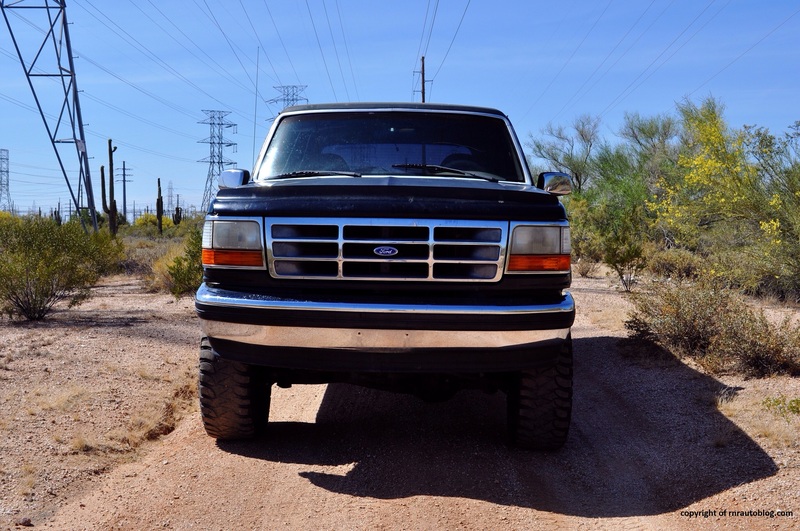 It looks old, drives like an old truck, and its fuel economy is laughable. But as a car guy, there is more to a car than you might think. Just because an old SUV cannot meet the tough standards of the latest SUVs does not mean it is any less memorable. 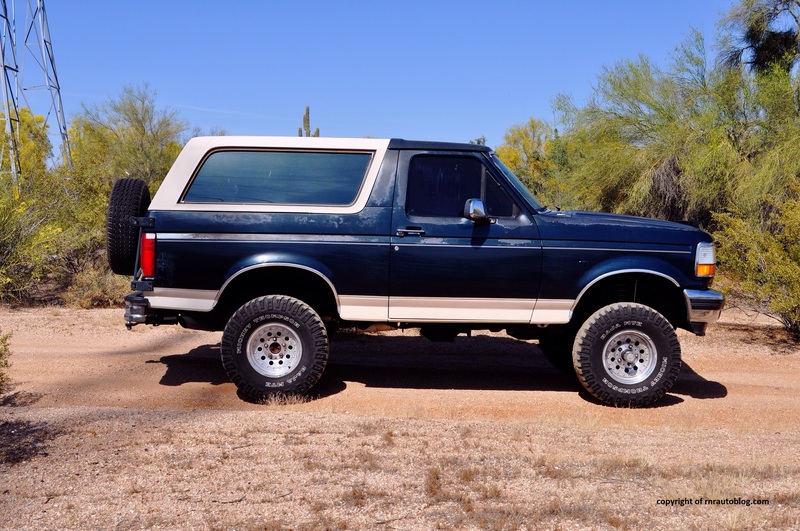 I like the Bronco, not because of its OJ Simpson-influenced fame, but because it is just a cool car. We went to the gas station to fill the Bronco up, and I noticed owners of a Toyota Prius, Honda CRV, and a Toyota Corolla staring at us. The reaction they got when they saw the huge Bronco was priceless, and I had to bite my lip just to stop from bursting into laughter. The coolness factor is apparent when you can drive like a bat out of hell off road, and not care about what people think. That is the beauty of the Bronco. It has a no holds barred approach about it, and that’s what makes it a lovable car. It actually has character, which not many cars have today. And for me, the flaws are worth it.